Should I Learn & Use Dangerous Submissions? Sep 22, 2018grappler zArticlesComments Off on Should I Learn & Use Dangerous Submissions? Heel hooks, calf slicers, and neck cranks are all deemed dangerous submissions and prohibited from competition by the International Brazilian Jiu-Jitsu Federation (IBJJF), a non-profit that hosts some of the biggest Jiu-Jitsu tournaments in the world. Usually, learning these dangerous moves are at the discretion of the BJJ instructor. Some students may never learn these submissions, but others begin to learn them from day one, especially if their academy is not focused on sports competition. Should academies teach these submissions at all? The topic is controversial, and this article will explore different answers to that question. If we explore the origins of Jiu-Jitsu during Kanō Jigorō’s time, we notice that he removed a number of techniques from Jiu-Jitsu repertoire that Judo would later take up. Jigorō removed moves that he felt were just too dangerous to practice. Traditional Jiu-Jitsu in Japan in the 1900s was focused around small academies where the ratio of students to the instructor was very low. The setup permitted the teacher to give a great deal of attention to his students and make sure that injuries were kept to a minimum. But in 19th and early 20th century Japan, the training was also rather brutal, and it was not uncommon for instructors to double as bonesetters. Dislocations and broken bones were frequent occurrences. Kanō knew that if the martial art was going to grow into popularity, injuries needed to be kept to a minimum. As a result, regulations came into place to teach Jiu Jitsu to large groups of people, with a minimal risk of injury. That’s why the more dangerous moves were removed. Now many instructors ask themselves if they should follow in his footsteps? The answer to this question varies. A black belt should have an in depth knowledge of most techniques, understanding that there is an almost limitless number of them to cover. It’s important to understand the execution of even the most dangerous moves to avoid getting submitted by others, who may not be a member of your academy. Realistically speaking, it’s important to remember that ALL submissions are dangerous if one doesn’t tap. If you don’t tap to something as seemingly inoffensive as an armbar, your arm might get dislocated. The problem with large academies is the diversity of people who practise different moves. For instance, during a roll your opponent may know nothing of a heel hook, or might defend the wrong way, and injure themselves. On the other hand, one might come across a student who knows no limits and could be dangerous. With larger academies, one has to be more careful. Many times, students will come up to their instructors, and let them know they don’t want to compete, and don’t believe they are ever going to get into a street fight, so they decide they never want to take the chance and learn any of those dangerous submissions. It wouldn’t be fair to force a group to practise those submissions. However, if you are on the road to a black belt, then it’s essential to know those moves. But it’s also mandatory to know how to stay safe. What’s important to keep in mind when practicing the more dangerous submissions is that you have to be able to trust your partner. Some BJJ students have such big egos, that they’re going to crank something if they can — which is not the proper way to train. Reckless BJJ training puts the limbs and the lives of our training partners on the line, and as students and teachers, we need to proceed with great care. Jiu-Jitsu is not something you can train by yourself, and you need to be mindful of others! If your training partner catches you in a submission, they should allow you to escape. They’re not going to crank, but rather just hold the position. From there, you can start to increase your confidence, and become more comfortable extracting yourself from submissions. There’s a lot more learning that can take place when you catch a submission, so lightly hold it, and allow your partner to escape. But allow them to escape in the right way. Others, may just catch the submission and let it go; you don’t need to tap someone every time. Learn the secrets of the Turtle Guard from the world champion who has used it for decades to beat the best fighters on earth. 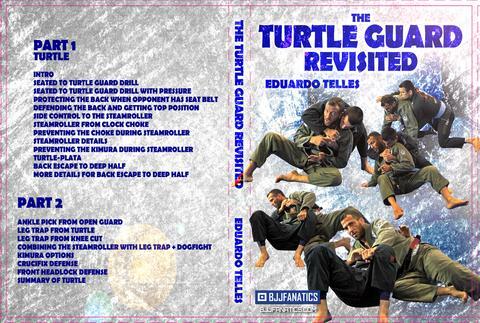 It might sound completely nuts, but Eduardo Telles beats the Best Guys – From His Hands & Knees.. Get a copy of his new release The Turtle Guard Revisited. You can get it here from BJJ Fanatics!